World of the Fifth Sun: Starting a more in depth review series. I wanted to take the information that I took for the last two months search for a fantasy or universal RPG and bring all of the information together per game. At least I will do it for the 8 games that I test played. It may lead to further test playing of games not played as well. Here is an overview look at what I did for that search which I've never shown before. 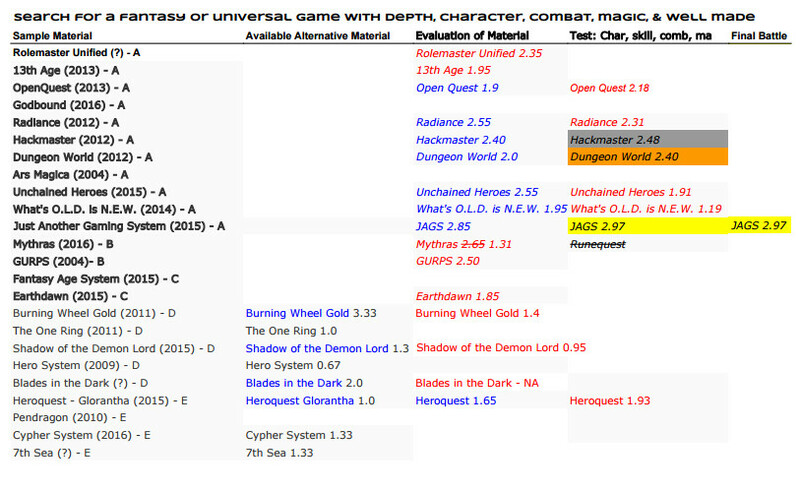 So I will go back and compile each of the game's information, beginning with JAGS, then Hackmaster, Dungeon World, etc.